ART OF TRANSIT: Culver City station from our Instagram account. A look at the possible route and station locations of the light rail alternative for the Green Line Extension project, which is partially funded by Measure R. The light rail option would extend the Green Line along the old Harbor Subdivision rail right-of-way to a new transit center in Torrance. More funding would be needed to reach Torrance. Assemblyman Mike Gatto authors an opinion piece calling for the Gold Line to be extended from Pasadena to the airport in Ontario to help improve transit in a region he describes as underserved. A Pasadena-to-Azusa extension is under construction and is funded by Measure R and a second phase to Montclair is in Metro’s Long Range Transportation Plan but is not funded at this time along with other unfunded transit extensions or new projects. Check it out! 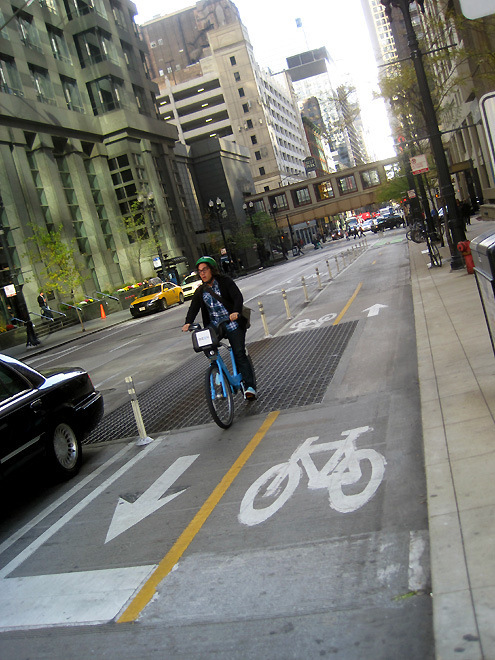 : a two-way protected bike lane in downtown Chicago. Photo by Brigham Yen. Brigham Yen finds downtown Chicago to be exceptionally clean and with good signage. “After 4 days of exploring, Chicago in a nutshell can be summed up as: 4-directional, walkable, bike-friendly, bustling, architecturally stunning, proud, and yes, evenimmaculate. Even the alleyways were clean. Amazing!,” he writes. The post has a ton of great photos backing up Brigham’s assertion. Pronghorn cross a road in Sweetwater County, Wyoming. Photo by carfull…Cowboy Stater via Flickr creative commons. Eight-foot-tall fences have been built to funnel pronghorn in Wyoming to a pair of overpasses and eight underpasses to help them get across Highway 191 on their annual 100-mile migration in Wyoming. After initial fear and anxiety, the pronghorn (commonly and wrongly called antelope) seem to be taking to it. That’s good news for proponents of highway wildlife crossings which are sometimes mocked for their cost and ambition — but in Florida, California, Montana and many other places are also proving to work. With the upcoming 12/15 service changes, Metro should once again include the zone fares information for the 400- and 500-series bus lines. I remember back then the zone fares were printed right on the timetables but they were subsequently taken out. It can be inconvenient without such information, especially for new and occasional riders. Thanks!